A seaside resort tucked away in Sardinia’s north-east, surrounded by stunning landscapes and a beautiful beach. Just 30km south of Olbia and boasting 18km of picturesque coastline, Budoni is a wonderful choice for those looking to embark on a summer beach holiday. Convenience is also a big draw for visitors here, as the main town is just a short walk from the white sands. Convenient for holiday-makers staying in the main town or driving from elsewhere, Budoni Beach provides a stretch of powder-white sands, lapped at by inviting, crystal-clear turquoise waters. There’s ample parking and a couple of beachfront restaurants, but overall the beach adopts a wonderfully rugged and natural feel, backed by a thick line of pine trees. There are also some sunloungers and parasols for hire at a few points along the sand. Just back from the beach you’ll also find a couple of brackish lagoons, where you can go to spot some pink flamingos. Just a 15-minute walk inland, visitors can explore Budoni’s town. Away from the busier summer months, it’s a sleepy town with a variety of different shops and restaurants down the main street. By day, pay a visit to the church of which the town is built around - the Church of San Giovanni Battista, and by night, enjoy the bars and nightlife. An intimate hotel with just 11 guest rooms, Relais Fenicottero Rosa is the perfect choice for those in search of total peace and quiet, again around a 25-minute drive from Budoni. Car hire is included with packages. 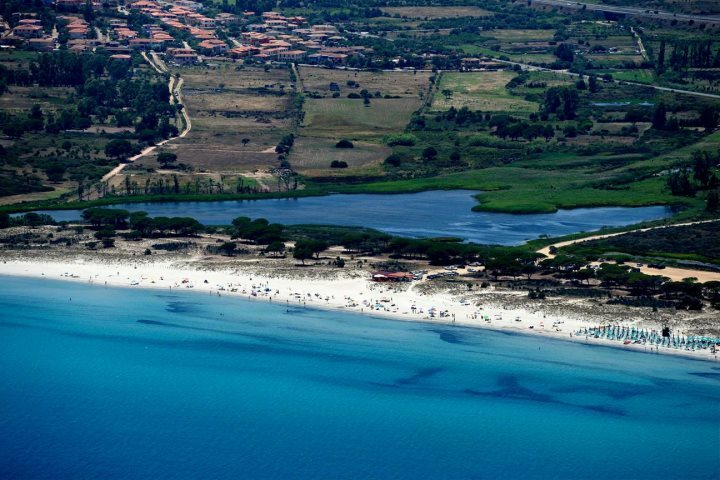 To find out more about a holiday to Sardinia, be sure to check out our holiday ideas.